This seminar will help you perfect your connection, timing and feet forward handling with your young or unseasoned dog. Feet Forward handling will help get the most speed and best turns from your dog. The sequences will have jumps and tunnels. No contacts or weaves will be used. Working dogs must have a good start line. Please do not register a dog that has focus issues or that can not deal well in a seminar environment. The aim is to work handling and not focus issues. If the event is full, please select the Register button and fill out the form to be put on the WAITLIST. We almost always pull from the wait list as we get closer to the event. Event fees are non-refundable unless filled via the waitlist. LUNCH WILL NOT BE PROVIDED. Please plan accordingly by bringing your own lunch. There are also many restaurants close to the center. Auditors are welcome! Auditing fee is $50/day ($25 half day). Auditors, pay day of event. Tracy Sklenar has been training dogs and competing in dog agility for over 20 years and is perhaps the only handler in the world who has won medals in international Finals as a coach for 2 different countries AND as a handler with her own dog in both team and individual events. She is on the faculty of Agility University (www.agility-u.com) and MasterClass (www.agilitymasterclass.com) and travels extensively to teach seminars and compete. Her “Feet Forward” approach to handling and emphasis on connection and reinforcement have helped handlers excel at every level and with every type of dog! 2017 has gotten off to a great start with success in the ring both here and abroad. After coaching the USA team at the IFCS World Agility Championships in Spain, Tracy has turned her focus to her own dogs. Export continues to do well, earning 1st place in the Performance Grand Prix and 2nd place in Performance Speed Jumping at the USDAA Regional in Georgia! Youngsters Voodoo and Nacho are beginning to make their mark in competition, with Voodoo gearing up for his first Cynosport World Games in October. 2016 was an incredibly successful year: Export enjoyed multiple wins and placements, including 3 Gold medals and 1 bronze medal at USDAA Regionals and capping the year off with multiple class wins at the World Cynosport Games and Silver medal in the Steeplechase Finals! 3 year old Voodoo qualified for the 2017 World Cynosport Games, and baby dog Nacho began his career with titles in Jumpers! 2015 was an exciting year, with Tracy and Export winning a Silver medal (Team) and Bronze medal (Individual Agility) for the USA at the IFCS World Agility Championships as well as winning multiple regionals and enjoying a very successful Nationals. 2014 was also a busy year, featuring wins in 5 different Regional Finals (in 2 different heights), a 4th place finish in the Steeplechase Finals at USDAA’s Cynosport World Games as well as running in both the Team Finals and the Master Challenge Finals, selection to a spot on Team USA at European Open, winning a spot on Team USA for IFCS and earning a Finalist spot at the AKC National Championships. Export has been on a total of 4 European Open teams, including running in the Finals in 2012 in Sweden! Before retirement, Rebound competed successfully at the National level in the USA and Canada, earning podium appearances at nationals in Performance Grand Prix, AAC Steeplechase and Veterans Grand Prix. Tracy has competed successfully in agility with a variety of dogs of all shapes, sizes and temperaments. Currently, she shares her life with 6 dogs: a Rat Terrier (retired 15 year old Rebound), 3 BC mixes (11 year old Export, 8 year old Matrix and 3 year old Voodoo), and two Papillons (4 year old Crusher and 2 year old Macho Nacho). In the ring, their runs are noted for focus, accuracy, consistency and speed! She began agility with 2 mixed breeds and 2 Dalmatians. Tracy also has extensive coaching experience, ranging from local competitors to international teams. She came out of team coaching retirement to coach Team USA at the upcoming IFCS World Agility Championships in Valencia, Spain and is back on board to coach the 2018 USA team in Italy. 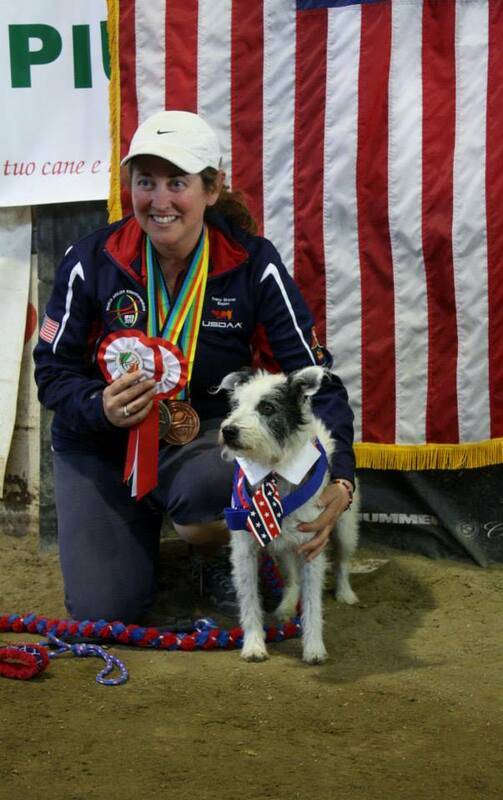 In 2012 and 2011, she was the Coach/Manager of Team USA at the World Agility Open in Belgium and the United Kingdom, and in both years was proud to see the US team bring home more medals than any other country both times! She served as the Manager/Coach for Team Canada at the IFCS World Agility Championships in 2008, 2010 and in 2012. These teams were very successful, ranking high in the Individual medal count and bringing home medals in the Team event. Outside of international competitions, Tracy’s local, national and international students from live classes, seminars, and online classes have achieved great success with a variety of breeds, including championship titles, national finals appearances, top five finishes in their breed, Invitational appearances, and more! Tracy uses positive reinforcement, motivational games and shaping to build brilliant behaviors in the dogs while teaching the handlers to be consistent and positive in their handling and dog training. She is heavily influenced by various international styles of handling and emphasizes teamwork, connection, consistency, mental focus, play and fun for both the handler and the dog to build a clear system of communication for each team.